After suffering through a painful 11-21 season that would have driven many head coaches to drink, UNLV head coach Marvin Menzies and his staff popped open a recruiting six-pack that ranks among the nation’s best classes. A brimming Menzies announced the names of his highly-touted class during a press conference on Wednesday afternoon at the Mendenhall Center. “I would say it’s a grand slam,” Menzies said of the group topped by 6-foot-11 McDonald’s All-American Brandon McCoy and 6-7 forward Shakur Juiston of Hutchison Community College, the MVP of NJCAA Tournament. Also signing with UNLV were 6-7 forward Tervell Beck of OnPoint Hoops Academy in El Reno, Okla., 6-11 forward Chiekh Mbacke Diong of Florida Prep Academy in Melbourne, Fla., 6-2 point lefty point guard Amauri Hardy, a one-time Oklahoma State commit from North Farmington (Mich.) High School and 6-7 forward Anthony Smith from Feather River College in Quincy, Calif. They join 6-5 guard Jay Green of Hillcrest Prep in Phoenix who signed with the Runnin’ Rebels in the fall. McCoy, an athletic big man with a soft shooting touch ranked the No. 15 prospect in the nation by ESPN.com, leads the way after averaging 28.6 points, 12.6 rebounds and 5.3 blocks per game at San Diego’s Cathedral Catholic High School. He had 13 points and seven rebounds in the prestigious McDonald’s All-American game and also played in the Jordan Brand Classic at Barclays Center in Brooklyn, N.Y.
“He is already recognized on the national scene as one of the best high school players in the country,” Menzies said. NBAdraft.net already has McCoy projected as the 18th pick in its 2018 mock draft and Menzies admitted his prize big man recruit could be a one-and-done. 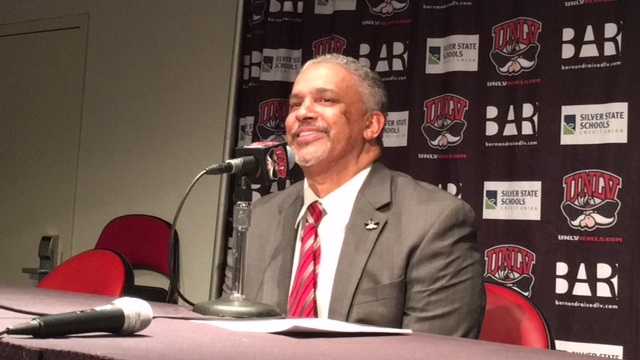 Long rumored to be leaning to UNLV, McCoy picked the Runnin’ Rebels despite strong interest from Oregon, Arizona, Michigan State and San Diego State. Menzies said McCoy’s commitment on Twitter on Tuesday night also played a key factor in UNLV signing Juiston and Hardy on Wednesday. “He is the National Junior College Player of the Year and is a winner,” Menzies said of Juiston, who averaged 17.3 points, 12.1 rebounds and 3.9 assists as a sophomore while helping lead Hutchison to the national title. Hardy is a four-star recruit ranked the nation’s No. 22 point guard prospect by ESPN. He averaged 29 points, seven rebounds, six assists and six steals per game as a senior while also shooting 45 percent from 3-point range.